Most genealogists reading this are probably asking, "He meant TWO MILLION names, right?" But, no, this post is about death details for two individuals, thus, highlighting the distinct value provided by the database project at Genealogy Today. Genealogical success is the result of "beating the odds"... will I find MY ancestor among the billions of records that exist? And the Internet has greatly improved that probability by making it significantly easier to perform a search from the comfort of your own home. So, while the genealogy juggernauts (i.e. Ancestry, MyHeritage, and FindMyPast) continue to post millions of records every week, Genealogy Today tries to add very unique items to the mix: small documents that you're not likely to find elsewhere. 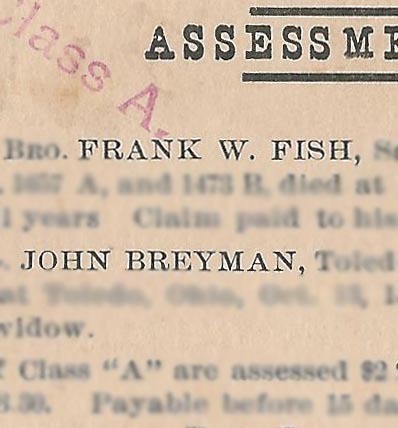 This includes a post card transcribed last week from the North-Western Ohio Masonic Relief Association that recorded the deaths of Frank W. FISH and John BREYMAN. Mutual Relief (or Aid or Benefit) Associations were the precursors to modern insurance companies we're all familiar with. They differed, however, in that their members were required to "pitch in" whenever another member passed away. Each member was sent one of these postcards, assessing them for a specific amount and providing the details of the deceased members. I suppose it was their way of providing "proof" that the company was actually providing the benefit it had promised. Insurance records are an overlooked, yet often very fruitful, genealogical resource, and this is one area where Genealogy Today has compiled data from hundreds of original documents -- acquired and painstakingly transcribed. While an affordable subscription is required for full access (and thus to the details of these assessments), the resources can be searched without any commitment (no trials, no credit card given in advance).